This animation shows how the floating debris from the MH370 aircraft could have spread, from the day of the crash up until May 2016. The crashed remains from the Malaysia Airlines Flight MH370 could be as much as 500km further north than the current search area, say scientists in Italy. Their assessment is based on the location of confirmed debris items and computer modelling that incorporates ocean and weather data. They say this has allowed them to determine where the plane most likely hit the water and where future aircraft fragments might wash up. The MH370 search will soon be halted. Authorities have agreed that "in the absence of new credible evidence" the effort to find the plane on the ocean floor west of Australia will be suspended once a zone covering 120,000 square km has been fully surveyed. That could happen in the next few weeks. A team led by Eric Jansen, from the Euro-Mediterranean Center on Climate Change in Italy, is the latest to try its hand at using modelling to identify the impact site. The approach relies on two years of high-resolution data that describe the currents and wind conditions across the Indian and Southern oceans. Multiple simulations were used to predict where objects might drift given different starting points. These forecasts were then analysed and the greatest weight given to those tracks that best matched the locations of known MH370 debris items. 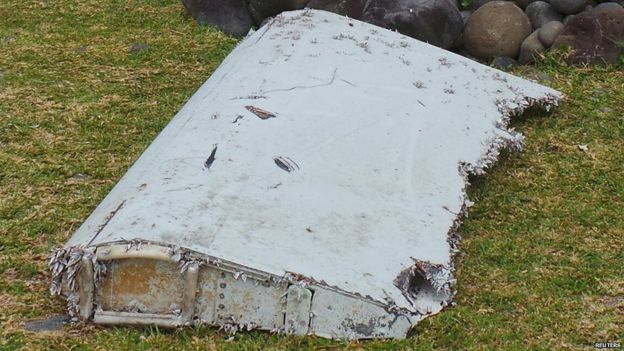 These are the parts of the Boeing 777, such as an engine cowling and wing flap, that have since washed up on the beaches of Africa and Indian-ocean islands. To improve their simulation, the researchers used the locations of the five confirmed debris found to date: two in Mozambique and one each in Réunion, South Africa and Rodrigues Island (Mauritius). The conclusion is that main wreckage of the plane is likely to be in the wide search area between 28 degrees South and 35 degrees South that was designated by crash investigators. However, only the southern end of this zone - a priority segment between 32 degrees South and 35 degrees South - is currently being surveyed by underwater cameras and detectors. This still leaves a swathe of ocean floor to the north where Dr Jansen and colleagues say MH370 could possibly be resting today undiscovered. To find out how MH370 debris drifted since the crash, the researchers ran a computer model that used oceanographic data from the EU Copernicus Marine Environment Monitoring Service, including data of global surface currents and winds over the past two years. One of the advantages of the type of model produced by the team is that its solutions can be updated as more debris is found. "We use the location where debris is found to create a ranking of the different simulations. So, the simulations that cause debris in all of the locations where this material was found - we rank those higher; and the ones that are not as good at predicting the locations of the debris - we rank them lower. And then we combine the result. This has the benefit that if new debris is found we only have to repeat the ranking, which is very fast, while the simulations of drift over two years take several hours." An animation of the debris pathways originating from Location 11. The tracks of particles over a ten day time window are shown. Animation courtesy of the University of Western Australia. 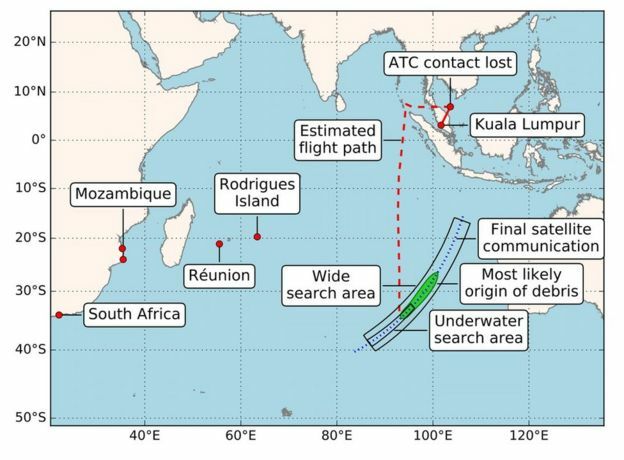 This means also that should more debris come to light, the model will refine its solution for where in the ocean the missing jet is most likely to be found. And given that the underwater search is about to be suspended, Dr Jansen says perhaps greater effort should now be directed towards finding more washed-up debris. It is an endeavour that would be low-cost, he argues, but would very much aid the type of research he does, while at the same time possibly yielding additional information on the state of the aircraft in its final moments. Such inferences can be gleaned by examining materials for tell-tale damage. Dr Jansen and colleagues have published their research in the journal Natural Hazards and Earth System Sciences. Malaysia Airlines flight MH370 disappeared in March 2014 with 239 passengers and crew.